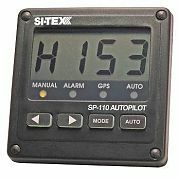 Designed for small boats, the SI-TEX SP-110 autopilot brings all the features of more expensive models into a single compact unit, without the need for a separate junction box. Suitable for small motorboats as well as sailing yachts up to around 15 meters. Designed to an industry standard 110mm square casing it fits nicely together with other instruments. 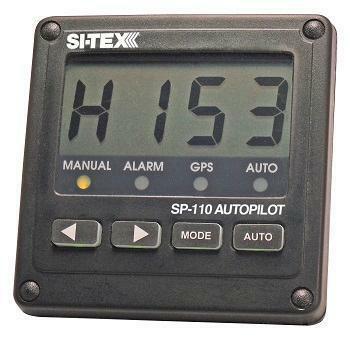 SI-TEX has developed the SP-110 to provide performance and reliability for the small boat user. There are simply no other autopilots on the market so compact and easy to install with the same level of functionality. Steer to GPS or Steer to Wind modes. SP-110 Control Unit, Electronic Compass Sensor with 5 metres of cable, mounting hardware and brackets, operation manual. This drive unit replaces a manual Tilt drive and is mounted directly behind the dash, but still allows the angle of the steering wheel to be changed. It uses the front end from Teleflex SH91800 (not supplied).Additional items my be required to adapt to your steering system.